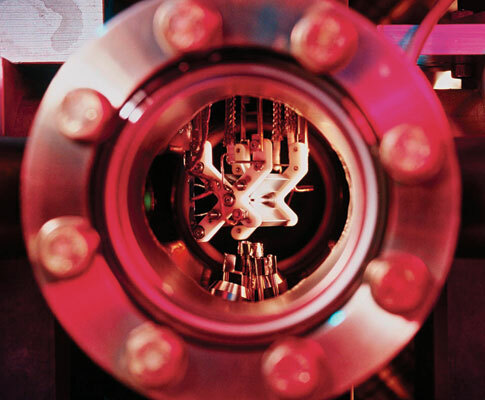 Reality Check: This real-world teleportation device (ion trap show here) just moves atoms. Apparently, a few people at the U.S. Air Force Research Laboratory forgot to turn on their crackpot detectors. The lab-commissioned “Teleportation Physics Study,” which was recently released on the Federation of American Scientists Web site, makes for some of the most inane and entertaining science reading of the year. Although scientists have only just teleported the properties of an atom, the author of the report, Eric W. Davis, a physicist affiliated with a company called Warp Drive Metrics, writes as if the technology for moving people is already here. One of the stranger qualities of the paper is that the same concept seems realistic on one page and distant on the next. Oh, those important little details. They always seem to get in the way of potentially revolutionary technologies. Still, despite the very large hurdles, the author—who is something of a mystery himself, as his company, Warp Drive Metrics, is not actually registered as a business in Nevada, and he has not returned phone calls or e-mails from Popular Science—recommends spending $7.5 million for further study. Air Force Research Laboratory spokesman Ranney Adams says there are no plans to take his advice.